Actress Wendy Richard is to leave EastEnders after almost 22 years playing Pauline Fowler in the TV soap. She is one of just two cast members who have been in the BBC One hit since it started in 1985. The other is Adam Woodyatt, who plays Ian Beale. She will depart in a dramatic storyline at Christmas and said she had "loved every minute" of her time on the show. Her spokesman added there had been "no arguments or quarrels" and she simply felt it was time to move on. Richard said when she was first approached about the role, she "never would have thought that 22 years later, I would still be playing her". Have your say - will you miss Pauline Fowler? "But nothing lasts forever. I've loved every minute of being part of this fantastic show, and will stay in touch with the many friends I've made," she said. Pauline's memorable storylines include giving birth at the age of 41 to her son Martin and coping with the breakdown and death of husband Arthur. She also discovered her son Mark was HIV positive and her daughter Michelle was pregnant by Dirty Den. 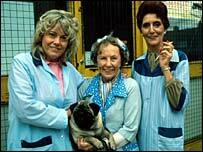 "For many years, Wendy simply was EastEnders for the audience," the programme's executive producer Kate Harwood said. "Pauline's indomitable nature typified the grit and fight that embodies the EastEnders spirit as she took on the world and battle through her many troubles." BBC controller of continuing drama John Yorke said Richard "occupies a huge place in people's hearts". He said she would be missed most for "the sheer pride and love she showed for her character, her fictional family and, of course, the show". Richard, 59, has been at the heart of few big recent storylines. She was diagnosed with cancer four years ago but returned to work within months. The actress also appeared in BBC sitcom Are You Being Served? for 13 years and was made an MBE by the Queen in the Millennium Honours List. 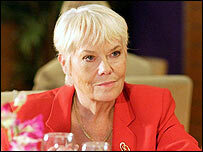 Will you miss Pauline Fowler?